Would the real Branden Jacobs-Jenkins please stand up? Throughout half a dozen plays, the restless, talented writer has flaunted a genius for polymorphous perversity. His output includes absurdist neo-minstrelsy (Neighbors), meta-historical race melodrama (An Octoroon), pitch-black workplace comedy (Gloria) and metaphysical family drama (War). His next move—of course—was to update the 15th-century English morality play Everyman. To be fair, satire runs clearly through Jacobs-Jenkins’s sensibility as well as a fascination with the ways in which blackness is appropriated and defamiliarized on stage. In Everybody, characters argue about racial insensitivity and political correctness, but that almost feels like a red herring. This time, the writer is chasing a bigger, faster-moving target: mortality and morality. 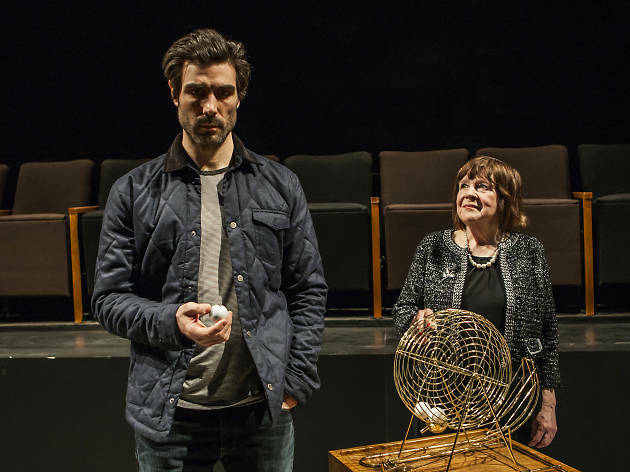 In the source play, God enlists Death to call Everyman to account for how he lived his life. Terrified about facing extinction alone, our allegorical hero turns to family, friends and even anthropomorphized possessions for companionship as he travels to the other side. Each rejects Everyman in turn, until he is left with only his five senses to face the grave. 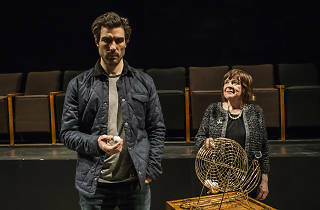 For this very meta and saucy adaptation, Jacobs-Jenkins neutralizes gender and randomizes the casting: Five actors who, we're told, memorized the entire script (Brooke Bloom, Michael Braun, Louis Cancelmi, David Patrick Kelly and Lakisha Michelle May) are assigned their roles by lotto-style Ping-Pong balls. The night I attended, Cancelmi played a fittingly gaunt and grim Everybody, whereas the radiant Bloom was fair-weather Friendship. As God and Death, Jocelyn Bioh and Marylouise Burke keep the eschatological humor in high gear. Apart from the cast’s charm and visual coups engineered by director Lila Neugebauer (Giant, glow-in-the-dark dancing skeletons! A surprise Beckettian wasteland! ), the 100-minute experiment feels overlong and talky. Jacobs-Jenkins introduces voiceovers and inner monologues, perhaps to vary Everyman’s schematic structure, but the extra verbiage blunts any philosophical edge. Lord knows we don’t need a “faithful” revival of this theatrical fossil (it came a century before Ben Jonson, for pity’s sake), but I’m not sure this slangy, digressive gloss adds much substance. Stranded between cosmic earnestness and a collegiate urge to interrogate weird old texts, Everybody has trouble holding onto a fixed identity. Pershing Square Signature Center (Off Broadway). By Branden Jacobs-Jenkins. Directed by Lila Neugebauer. With ensemble cast. Running time: 1hr 40mins. No intermission. Through Mar 19. Click here for full ticket and venue information.